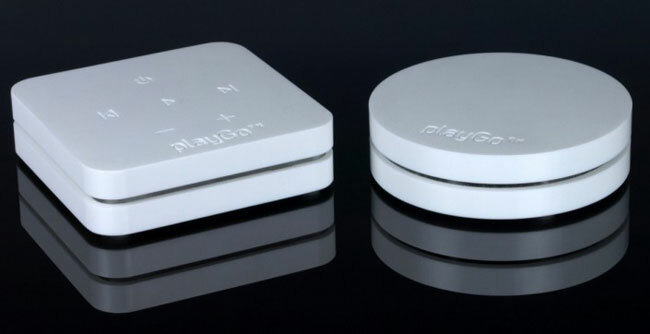 If you are looking for an easy way to get the music stored on your Mac or PC to any of the audio devices in your house playGo USB may be the product for you. This system has two parts with a sender and a receiver. The sender works with Mac or PCs and needs only a single USB connection. No software is needed all you need to do is plug the sender in and press play to get it to work. The receiver needs an AC outlet to operate and has RCA and digital outputs to shoot tunes to anything from your home stereo to home theater system and even some headphones. The outside of the device is made from machined Corian. Some countertops are made from this material. The device comes with all the cables you need including the USB cable for connecting to the computer. The only real downside is the price; this thing is well over $450.